The Omar Ibn Said Collection consists of 42 original documents in both English and Arabic, including the manuscript in Arabic of “The Life of Omar Ibn Said” - the centerpiece of this unique collection of texts. Other manuscripts include texts in Arabic by another West African slave in Panama and from individuals located in West Africa. Conservators at the Library of Congress performed treatment to physically stabilize the Said manuscript, mending and reinforcing its fragile pages. Following multiple owners and the ravages of time, the pages were weak, exhibiting holes, heavy creases and torn edges. February 5, 2019, at 10 a.m. to 3 p.m.
10 First St. S.E., Washington, D.C.
For more information about the event, visit loc.gov/item/event-394446/conversation-on-the-omar-ibn-said-collection/2019-02-05/. 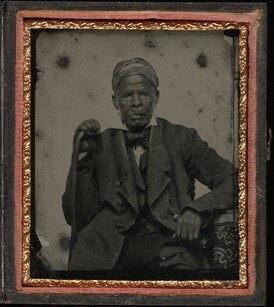 Image: A portrait of Omar Ibn Said around the 1850s. Photo courtesy of Yale University Library.